We'll it's the second week of TNT Thursday and it's going Baking. Ya, so basically, this MBS post was scheduled long before TNT was born so they are sharing the spotlight today. But . . . it is a lovely way for me to introduce a feature that I was toying around adding to TNT. So since the stars aligned and these two features collided on the same date . . . I give you the first Tutorial Feature of TNT Thursdays!!! I call it "All Framed Up" and you can find the step-by-step tutorial to make it over at the Moda Bake Shop!!!! This baby quilt is super easy to make and honestly, I just can't get over how adorable it is!!! I made it for the newest addition to our family, Baby Jocelyn!! And isn't she just the cutest little model!! And as always, the amazing Leah over at Burgundy Buttons has made an equally adorable All Framed Up Quilt Kit available for purchase at a fabulous price. So that is what I tried this week . . . What did you try??? 3 - Those cute little 3" squares needed to be turned into a 6 1/2" block to be sent to beebolt. Everyone at the summit got some and they will be turning all of the blocks into a large quilt that will be revealed at next years Sewing Summit. So cool!!! I have no idea what I want to do with them. Any suggestions??? 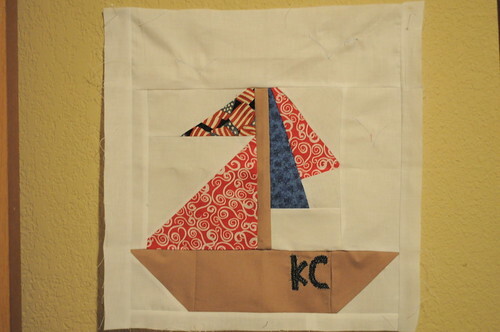 I just keep getting more and more excited about this "Going Places" quilt for my little guy!! Here are some of the newest blocks. This block was done by Meghan. This is so adorable and I love that she stitched his initials into the boat!! How cute!!! And then there is another block done by Krista but I couldn't get it to link from flickr. So take a second and check out these two links. She even put a dog in the window of the Firetruck!! How cute is that!!! Thanks again to the amazing ladies of the VIBee Group!! This quilt is going to turn out so fun for my little guy!! 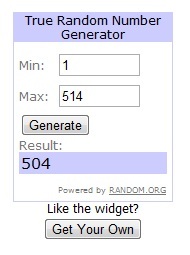 Onto the Winners of the Fat Quarter Shop Giveaway!!! 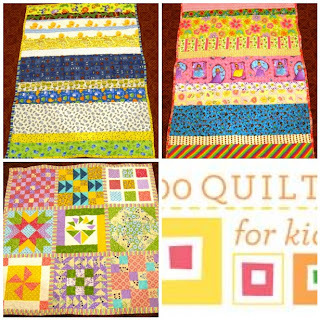 Once again, thank you so much to Kimberly and Crew for their continued support of Happy Quilting!! And the lucky winners are . . .
Congrats to Happy Cottage Quilter and Stevens Family!!! And thank you to everyone who entered!! Have a Happy Quilting Day!!! 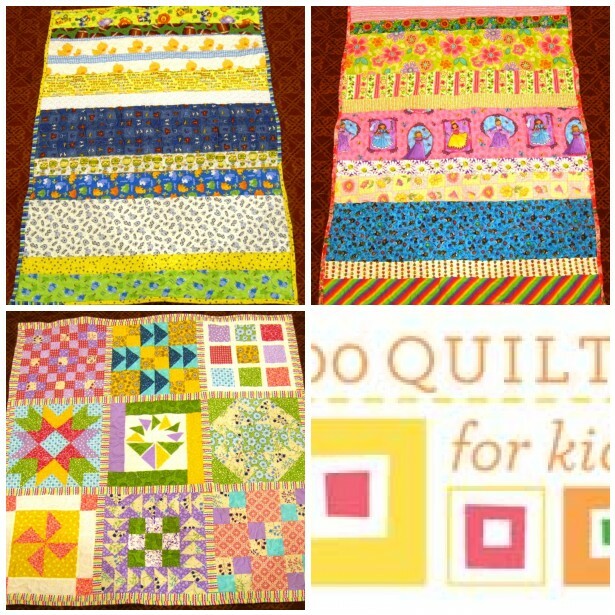 Today is the second link up for the 100 Quilts for kids. I have been wanting to participate in this wonderful charity function since I first heard about it. I figured I had the two strip quilts completed over a year ago and the blocks of the last quilt done earlier this year (poor abandoned projects) that would work perfect for "Kid Quilts", as they are so bright and cheery. I figured with having a good portion of the work done and only needing to assemble the one quilt and then quilt and bind them all that I would finish in plenty of time. So here they are :) A cute stripped boy quilt. I just love all of the bright colors and the cute patterns :) It is totally all boy!!! And this is the girl version of the stripes. My daughter just loves this quilt so I am hoping it will make another little girl equally happy.